Linn County (Oregon) Sheriff Tim Mueller: you are the man of the hour! Subsection (c)(B) requires licensing of ANYONE who works on your firearm or your magazine outside of your home. The "inspector" would need a search warrant. This bill would place your home, where you keep your personal firearms, in the same category as an industrial environment where explosives or caustic chemicals are stored. WTF? A 17-round pistol magazine is as dangerous as TNT? As for licensing gunsmiths ... why? Why can't my friend, who knows more about guns than I do, perform repairs on my AR15? Or my Garand, which (if I understand the definition of "assault weapon" would also be classified as an "Assault Weapon"? Or fix my 17-round pistol magazine, for that matter? This is analogous to requiring that my cousin be licensed before he can fix my car under the spreading chestnut tree in his back yard. This, in the country which once lauded "The Village Smithy"? We don't need no stinkin' license. This is America, dammit. Okay, so much for constitutional issues and unreasonable governmental regulation of trade. (4) A person may not register more than one assault weapon and three large capacity magazines under this section. Additional assault weapons and large capacity magazines must be disposed of in the manner specified in section 3 of this 2013 Act. I carry three (or four) magazines for my Limited gun, and the same for my Open gun. Different calibers, they require different magazines. So, even though my Limited gun would NOT be an "Assault Weapon" and my Open gun MAY not be, I still can't choose which division I want to compete in because I just plain can't own that many magazines. Don't tell me I don't "need" them; when I shoot my Beloved Kimber at a match, I have six or eight single-stack magazines on my belt, because when you have limited magazine capacity you often have to reload every time you move, dropping a magazine which still has ammunition left in it. Standing Reloads are not competitive, and they are embarrassing. Worse, when you have a jam and drop a full or almost full magazine, you "need" to have more magazines that you might have expected. I'm a Grumpy Old Man. At my age, I don't need the irritation of a bunch of leotard nit-wits screwing with one of the few pleasures left to me: I can't sing, my woman is gone, and I already drink more than is good for me. Now they want me to hang up my guns? This whole Registration/Confiscation/Class B Felony thing pisses me off. Who do these yahoos think they are, telling me I can't play with guns? Excuse me, I need to go replace the duct-tape wrapped around my head. And pour myself a drink, while I cool off. OREGON: Worst Gun Laws in America? Creates crime of unlawful possession or transfer of assault weapon or large capacity magazine. Punishes by maximum penalty of 10 years’ imprisonment, $250,000 fine, or both. Requires current owners to dispose of or register assault weapons and large capacity magazines. Directs Department of State Police to conduct background checks and maintain registry of assault weapons and large capacity magazines. This bill was introduced on my birthday to the Oregon State House of Representatives. Michael Malkin has some unkind words to say about it. And of course, after registration comes confiscation. Here's the Washington Post's take on the effectiveness of the 1994 Assault Weapons Ban .. essentially, they think it was A Good Idea, but ten years was just not sufficient time to properly evaluate the laudable effects of the law. Factcheck (an Annenberg project) strongly implies that the 1994 ban on assault weapons showed a lowered risk by "assault weapons" but it was offset by crimes involving "hi-capacity magazines". Obviously, Oregon Liberal Representatives have decided to correct the errors of preceding administrations by banning both. law took effect, and prices fell afterward. [emphasis added] Note that the comment "prices fell afterward" doesn't mean that prices fell after the ban took effect; it refers to the fact that prices fell after the "SUNSET CLAUSE" in the original bill took effect in 2004! As for the comment that "...they must have become less accessible to criminals..."; that strikes me as especially facetious, in that criminals have always had access to banned items. That IS their Job Description! The State Representatives are all Democrats. The State Senators are all Democrats. I've written to MY state representative. If you live in Oregon, I suggest you do the same. Perhaps you'll manage to sound less outraged than I did. Thank you for your letter about HB 3200. I am not one of the co-sponsors of the bill and I do not serve on a committee that considers gun related bills, so I have not had time to look at it carefully since it was introduced on Friday. It is my understanding that gun bills are unlikely to receive hearings this session. In the event the bill does come out of committee, I will remember your concerns as I evaluate the bill in its final format. It happens every now and then, and I usually ignore it completely. 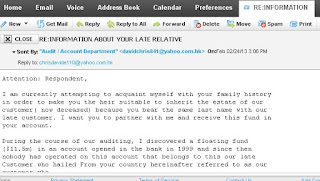 I get another version of "The Nigerian Letter" (the "419" scam) inviting me to give them sufficient information for them to find, and raid, my bank account. and was killed as a result of an attack from Niger Delta Militants. 3. Your Telephone and Fax number. detailed information about this case. Essentially, this complete stranger expects me to provide sufficient information that he can at least made a 'good effort' to discover my Social Security Number. That, with my full legal name and current address, along with my DOB, might be sufficient to access my SSN account along with any other 'fiduciary' accounts I have. 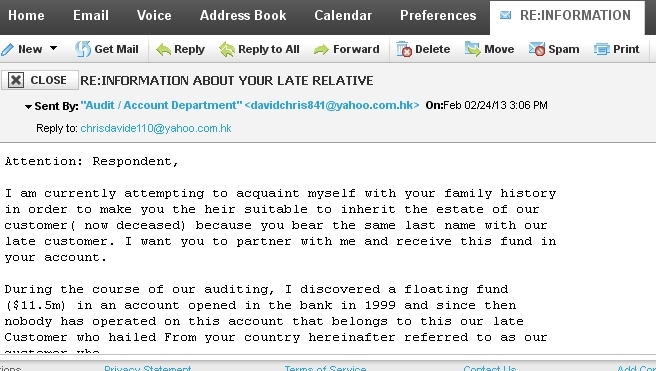 SENT BY: "Audit / Account Department"
The first thing to notice (and a give-away that it's bogus, if you didn't already notice) is that the reply email address isn't the same as the "from" email address. Also, email does not directly cite either my name or my email address ... another sign that it's a 'mass email'. Most of the information requested does not seem necessary. The email address to which the prospectus was sent does not include my family name, and never has, so the author couldn't know MY last name. How would he have matched me to the supposed deceased relative? It's all just bogus, free-lance larceny, and we all benefit from any pressure we can apply to these predatory bastards. Just find the link to "... contact your nearest FBI office ... " and get the email address. If nothing else, you may get an email from the FBI, and won't THAT be exciting! NOTE: If you're one of those people whose priority is to "fly low", you may choose not to report the email. On the other hand, if you are really "maintaining a low internet profile", you probably won't receive one of these emails, anyway. AAARGH! My CHL License has Expired! A couple of nights before, it occurred to me to look at all the cards in my wallet to see if I need to renew any of them: driver's license, credit cards, library card, Costco card, and ... Concealed Handgun License (CHL). Oh dear! My CHL expired in November of last year! This only goes to show how much importance I put on it. I monitor my credit cards and their associated accounts constantly, but when is the last time I looked closely at my CHL? A little background is required: I originally applied for it because I frequently carry firearms in my car. Without a CHL, I'm not sure what my legal obligations are. If I casually toss my range-bag in the back seat of the car, it's conceivably within reach. And there's always ammo in the bag, if not loaded in either the magazines or the gun itself. Am I violating a law? I don't know, from one year to the next. So I applied for, and eventually received, a CHL. No more worries. Even a gun in my car fall (under certain circumstances) as a "Concealed Handgun", I'm covered. I actually renewed the five-year license before it expired last time, but I fear I have become complacent since then. NEW REQUIREMENT EFFECTIVE MARCH 1, 2011: PROOF OF CITIZENSHIP. Birth certificate, passport or appropriate INS forms. PICTURE. A picture of you will be taken when you turn in your completed application. What this, is ... once again, my life mission seems to be to serve as a bad example for the edification of friends and family. If I had renewed 3 months ago, the process would have been much simpler.